*The following are summary of questions and answers regarding the business report. Question: How have you allowed for the influence of current sovereign risk in Europe, fiscal austerity, the weak Euro, etc., in your financial results predictions for the fiscal year ending March 31, 2011? It is possible that there may be some influence on our results if the current 110 yen/Euro rate continues. We are aiming for increased income and profitability, however, even if this happens. There are some concerns about our business in Europe, but for example in Greece, the size of the market there is not large. Therefore we feel we can minimize the effect. Some of our European countries have benefited from the weak Euro, in fact, and we are not feeling any particular problems with business in those regions. We are prepared, however, for the economy itself to be severely effected, and are pressing ahead with further strengthening our business base through CRGP. Question: Ricoh is holding shares in companies such as SAN-AI OIL, Coca-Cola West, which do not seem to have an association with its business interests, as part of the Ricoh San-ai Group. Do you have any intention of changing this in the future? The Ricoh San-ai Group is a business alliance that was forged by our founder, Kiyoshi Ichimura. Our companies share DNA, and we intend to continue working together in a variety of ways that will allow us to sharpen one another in the future. Question: Ricoh is an environmentally-friendly company, which is engaged in a whole range of activities. Perhaps a lot of people do not know about these activities. Since these environmental activities are a positive thing for the company’s image, do you not think it would be helpful to communicate them more widely? Our company has spent a long time working on its environmental management. We will continue to do this in the future. Thank you for a most important opinion. Question: We hear that the company has begun operating its plant in Thailand, and are concerned by reports of political uncertainty there. We also hear that there have been some strikes in Japanese components plants in China. 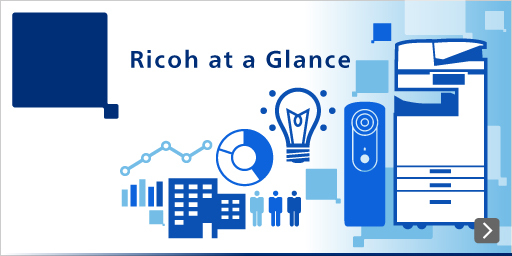 How do you perceive the risk of these factors in terms of Ricoh’s progress into Asia? In terms of Thailand, there was a period during which the downtown area of Bangkok was in chaos, but our factory is around 2 hours from there by car and was not affected at all. We have been working with local staff in China for many years now, and there have been no such problems for our business. We are planning ahead in the assumption that this will continue to be the case. Question: We have discussed China and Thailand. Have you considered opening a plant in India in the future? That is uncertain at the moment. The Indian market is certainly growing fast, and the manufacturing infrastructure is getting better. Based on these assumptions, it is impossible to deny that we may eventually look at a strategic development there. Since we have just begun working in Thailand, however, we would like to firm up our operations there in the first instance.